Misfortune cookies, black dog macaroons, and grey cloud cupcakes. Not the most uplifting sounding things. But these are in fact sweet treats made by master bakers behind the "Depressed Cake Shop" pop-up phenomenon. The bakers are using their creations as a way to overcome depression and put a smile on people's faces. Misfortune cookies, black dog macaroons, and grey cloud cupcakes. Not the most uplifting sounding things. What do you say to a friend with the blues? Maybe "Cheer up" or a blunter "Get over it" - two of the answers featured in these cakes. 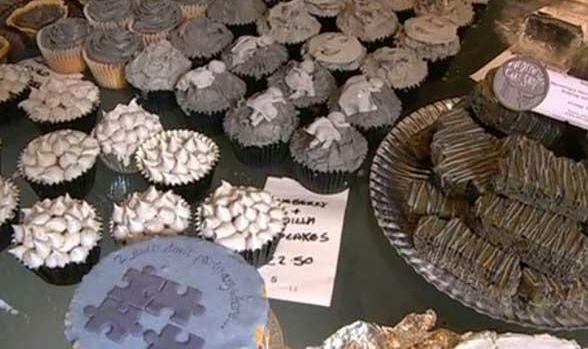 A group of bakers in the UK are highlighting the prejudices facing people with mental health problems using their cake making skills. And their efforts are on sale at pop up shops just like this one. These are a far stretch from your usual prettily-iced enticing treats. But take this "Marvin the Paranoid Android" - a tearful princess though it doesn't mean she doesn't have a beautiful inside. "All the cakes are absolutely delicious, so even though they look miserable, they taste amazing, so you know you've got ones that have rainbow interiors, there's lemon there's a grey miserable looking thing that's a grey tart, but it's actually strawberry and custard. So they all taste delicious and I guess it's just getting over that prejudice of grey cake, but that's the same with people who suffer from mental health issues." Emma Thomas, Founder of "The depressed cake shop" said. Everything is blue, or varying shades of grey, and all looking a little down in the dumps. The bakers here say it's time we stopped pretending the problem doesn't exist. "One in four people suffers from a mental health problem at some stage and one in four of my red velvet cakes are actually grey all the way through and that's also reflected in the decoration on the top. Three quarters of them have the sun, or flowers on them and the other 25 percent have clouds, or sad faces on them." Zoe Anderson, Chef said. These cakes have drawn in the curious, who are delighted to find a pleasant bite inside. The World Health Organisation says mood disorders cost the EU about 170 billion euros, or 225 billion US dollars per year. But a lifting cupcake here only costs you less than 2 pounds. What a deal! Misfortune cookies, black dog macaroons, and grey cloud cupcakes.